Masticating juicers are those juicing machines whose extraction mechanism doesn’t generate heat. They are also commonly known as “cold-press juicers,” as they first crush fruits and vegetables at a slow speed than other juicers, before pressing and commencing the extraction process–an act that significantly limits the generation of foam and heat while enhancing the efficiency. Are you looking for a good juicing machine to take care of your juicing interest? 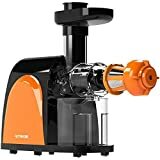 Below, we have listed a review of the top 10 best masticating juicers you can buy in 2019, and at the end; you should be able to make the right selection. Check out Best Vegetable Choppers! Starting our Masticating Juicer reviews is the SKG Wide Chute Masticating Juicer. The SKG is a low-speed juicer that makes your fruits and vegetable to taste better and fresher and is very nutritious. It has a 3 inches Big Mouth Wide chute—meaning that it will easily accommodate the large volume of items, and is more resistible to clogging. The SKG has a strainer base that when shut, keeps your juice safe and reduces oxidization during juicing. The SKG Wide Chute is a top quality design product, sleek, sturdy and easy to clean and move about. Omega is the most popular masticating juicer brand in the market. 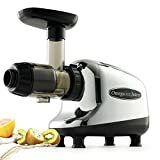 The Omega NC800 HDS is a silver color masticating juicer, with a low-speed juicing system that has a rotational speed of 80 RPM. It comes with exclusive dual stage masticating extraction system having five adjustable settings for the best juice output. The Omega NC800 HDS is also capable of continuous juicing, with automatic pulp ejection that makes the extraction much easier. It runs best on an 110 Voltage capacity. 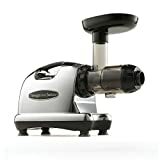 The Champion G5-PG710 is a Juicer that comes with 1/3 horsepower, comprising a heavy-duty General Electric motor. This masticating juicer makes it easier for you to eat more favorable and healthy foods. The auger construction of the Champion Juicer makes it possible to deliver continuous fresh and cool juicing, with automatic pulp; and is suitable for making Veggie Loafs, Baby Foods, Nut Butters, Fruit Sauces, Sorbets and a lot more. It has a large Feeding Tube measuring 1.75 in diameter, and a daring 10 years Manufacturing Warranty. Truly, this masticating juicer is a Champion. If your aim is to enjoy fresh juice within seconds, then you’ll need Kuvings Whole Slow Juicer. The Kuving B6000S has a 3-inches wide chute capable of holding lots of fruits and vegetable, saving preparation time while extracting juice with the rich nutritional package. The Kuvings runs on a powerful 240W motor, which slowly crushes all ingredients while operating very quietly. It also has all the elements of a basic masticating juicer. French Press Coffee Makers Reviews! The Tribest Green Star Juice extractor is an award-winning masticating juicer that comes with four different screens for a complete juicing extraction process. You have the freedom to adjust the level of pressure needed for pulp ejection so you can effectively manage a larger volume of items without clogging or jamming. The better part of it is that the Green Star also has Exclusive Magnetic and Bioceramic technology that enable you to extract juice containing higher nutritional content. 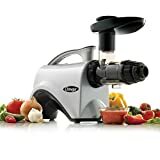 The Breville is a classic Masticating Juicer with direction controls that ensure that vegetables and fruits still hanging in the juicer are removed from the screws. It has a filter basket that automatically helps in purifying yields and for easy cleaning. The Breville Fountain Crush also has an overload protection system in place that automatically stops the machine from working once the load is too high. The Omega J8005 is a masticating juicer that prevents oxidization, protects and maintains healthy enzymes and allows you to store juice up to 72 hours without any form of degradation. It has a dual juice processing system that extracts the maximum quantity of juice from fruits, vegetables, etc., and it functions as a food processor, grinder, homogenizer and paster extruder; with 10 years warranty to cap. If you’re looking for a product with beautiful chrome finishing that perfectly blends with your stainless steel kitchen; you can count on the Omega 8008 Masticating Juicer. This juicer has a powerful commercial grade motor with a GE Ultem auger that’s 8 times stronger than melamine. The dual stage Masticating Extraction allows continuous juicing with automatic pulp ejection. The Omega 8008 is less foamy, quiet and comes with a jaw-dropping 15 years warranty. This is yet another efficient and highly productive juicer that will give you the maximum amount of rich nutrient from the barest amount of vegetables and fruits. The VRT350 has a pusher for pushing ingredients into the juicer, which also has a processing range of 80RPM while featuring 2 spouts and 2 containers—all of which allows food storage for 72 hours without degradation. With the J8006, Omega continues to dominate as the number one seller of Masticating Juicers; and it wasn’t difficult to pick our Top Product for this review. The Omega J8006 is in all aspect similar to its sister version—the J8005, except that the J8006 has a higher juice extraction yield, together with auto pulp ejection, dual stage juicing system, quiet operation, no clogging, no foaming; plus the fact that the screen comes already installed in the juicer. 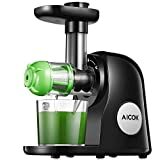 However, what makes it stands out from the rest is because it has undergone the highest review ever and still maintains the best rating more than any other juicer in the market. Top 10 Best Salad Bowls Reviews! If you are planning to buy a Masticating Juicer today, first consider the important facts below. The BUDGET: how much are you willing to spend on a new kitchen appliance? Masticating Juicers are expensive, with an average juicer costing above $260-$500. The SPEED: how quickly do you want to juice? Know that the faster the machine, the lesser the juice quality and juice yield. Is this what you want? Think about it. The DURABILITY: no one wants to throw his/her money in buying a product that will die the following day. Therefore, when it comes to durability, seek information regarding the screen, the pulp, the housing and the auger. The internet is your friend. The AUGERS: just like the teeth in your mouth, just as is the auger in a Masticating Juicer. Augers are responsible for squeezing the juice out of produce, which is only possible with sharp cutting teeth. Therefore, ensure your machine is capable of such cutting ability. Now, you have been given all necessary information you need to make the right decision concerning your juice and nutritional interest. Ultimately, the appropriate juicer for you is one which would meet your expectations and blends with your juicy escapades. You’re looking for that Masticating Juicer that would make you want it over and over again and surely; such lies in our review of the Top 10 Best Masticating Juicers in 2019. If you are reading this article, we believe you have already understood the benefits that masticating juicers can bringto your daily life. However, not all masticating juicers are good and can truly fulfil your needs. Below, we have gathered the top 10 best masticating juicers in 2019 that will definitely meet your requirements and preference. Coming to the first product on the list, we would like to introduce you Jese Slow Masticating Juicer. For those people who like to have smoothie, this product can be really helpful to you. It can also be an automatic orange juicer as well. Thanks to its slow speed movement, this juicer can ensure that your foods or fruits are well masticated. Thus, the foods or fruit you masticate will come with full nutrition, vitamins, enzymes, and minerals. Moreover, this masticating juicer does not only function as a juicer. 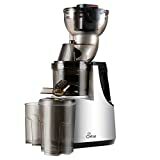 However, it is multifunctional which can also be used as a coffee machine, ice shaver, ice cream machine, baby food maker, soy milk maker, blender, and meat grinder. Designed with a large mouth wide chute, you can always put large food inside and let it work. Thereby, saving a lot of your time and energy. Furthermore, this product is very easy to assemble, and there is also an indicator light to notify you that you make the correct assembly. On top of that, it is easy to clean up, and can always be washed by cleaning brush. 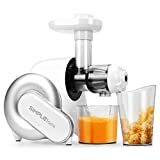 You would also love this SimpleTaste Electric Masticating Juicer if you are the beginner in juicing. 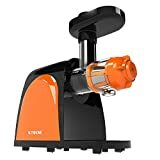 First of all, this masticating juicer operates in a slow mode which is great in extracting full vitamine as well as other mineral from the fruit to your juice. Moreover, it can also works as anything else more than just a masticating juicer. It can be used as an ice cream machine, ice shaver, baby food maker, soy milk blender, as well as meat grinder. Other than this, it is also easy to clean in which you can clean it with the cleaning brush attached from the purchase. Furthermore, you would also feel good while masticating your foods because it operate in a quiet mode. Therefore, it will not distract your attention. On top of that, it only takes you a sec to assemble. SKG Slow Masticating Juicer is a power juicer that you would love to own. With its slow speed operation, you can rest assure that this juicer can totally masticate your foods or fruits with preserved vitamins, enzymes, and other minerals. Moreover, it is also durable to use which means that it will not easily break. Being designed with large mouth wide chute, you can always put large foods or fruits inside this power juicer conveniently. Thus, it can save a lot of your time from having to cut it into small pieces. Moreover, this power juicer also operates in quiet mode which is a great point. By this, you would not be disturbed by the noise either. If you are looking for a low speed juicer, then this one is the right product for you. This Argus Le Masticating Juicer will slowly masticate your fruits. Therefore, it can extract 100% more juice than other regular blender. Although it can masticare your fruit completely, it is still capable of preserving vitamins as well as mineral inside your juice. Other than this, this juicer comes with a large mouth wide chute of 3 inches large which allows you to put large items to masticate. You would also love the quiet operation of this masticating juicer since it will not distract you while you are masticating. Furthermore, it is really easy to assemble which only requires you to set up step by step. This juicer also comes with a very good-looking design as well. Another product to be introduced on our list is SKG Slow Masticating Juicer. You would really enjoy masticating your foods or fruits due to its slow speed operate. Thus, this juicer can ensure 100% extraction of more juice and 100% preservation of vitamins, and other kinds of minerals. Moreover, the operation of this juicer is very silent. Therefore, when you juice, you would not be bothered by distracting noise either. Other than this, it is also designed with 3 inches large mouth wide chute in which you can have easy time accommodate larger foods inside the juicer. As being made from any high quality materials such as stainless steels, silicone component, and other anti-oxidation materials, this juicer is heavy and durable to use. On top of that, it also comes with sturdy handle which allows you to easy hold it, move it, and clean it. Nutrihome Masticating Juicer is a juicer that can be used for multiple purposes. The users usually use it to get more juice, extract more vitamins as well as more mineral from the foods or fruits you masticate. Moreover, this juicer also functions in a slow mode in which higher nutrition can be preserved and provided. Coming with a quiet operation, this juicer is convenient to use. In addition to its quietness, it is also easy to assemble which only takes you a few seconds. Unlike other regular blenders or juicers, this Nutrihome Masticating juicer only produces a very low heat which will not harm nutrition from the fruits. Apart from the products mentioned above, you should also take a look at Aicok slow masticating juicer as well. 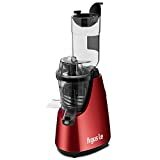 The users can use this juicer for multiple purposes such as getting more juice from fruits, gain more vitamins and minerals, and more. Because this machine totally masticates your foods and fruits in a very slow movement, higher nutrition will be maintained. Thanks to its quiet operation, you will never feel distracted when using it. Other than that, this juicer is also easy to install which will never cost much of your time. With the very low heat production, any vitamins as well as nutrition from the fruits or vegetables will be well preserved. Then, you can enjoy drinking a 100% nutritious drink. Chefmos masticating juicer is what you need if you are looking for a multi purpose juicer. This juicer is great for Masticating gingers, celery, wheatgrass, carrot, apples, oranges and other fibrous fruits as well as vegetable. Coming very slow speed of 80 rpm, this juicer is great at extracting more juice and preserving higher nutrition. Moreover, this juicer operate silently. Therefore, it will not disturb you or other people around. This masticating juicer is also easy to assemble and clean up. Use it for better juicing experience! 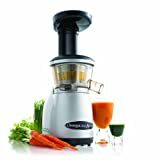 When you use this Omega masticating juicer, you will receive the most comfortable juicing experience ever because it operates very silently. Thereby, providing the most silent environment for the users and family. Furthermore, this juicer also operates in slow speed of about 80 rpm which means that your foods and fruits will be masticated smoothly. On top of its slow operation, this juicer does not produce any heat that will affect to nutrition or vitamin. For the installation of this juicer, the user only spend a few minutes to have it assembled. It is also easy to clean and store which really saves much of your time. Coming to the top product on the list, we would like to introduce you this Omega J8006 Nutrition Center Juicer. Thanks to its powerful motor, you can have an easy time using this machine. This juicer also operates slowly which ensures that there is no heat produced. Thus, it is very capable of preserving nutrition of the foods or fruit. Moreover, this juicer also operate quietly which provides you a very comfortable environment in the house when juicing. This machine is very suitable for juicing fibrous vegetables and fruit. You can now experience the best juicing time ever. By now, we believe that you have already found a masticating juicer whose its feature as well as functionalities can really fulfill your needs and that of your family. If this is the case, you are now just a click away from owning an ultimate masticating juicer. Click to order to own the best product of all time. Juicing is the simplest way you can employ to change your decades of unhealthy eating habit and improve your daily nutritional intake. The processing and consumption of fresh vegetables and fruits become less cumbersome with the use of innovative juicing machines; of which one is the Masticating Juicing Machine.